Fishing at Elan Valley & Claerwen Reservoirs01597 810 383 work FishingSituated in the heart of the Cambrian Mountains, 3 miles west of Rhayader, lies a series of four wonderful Reservoirs and Dams. Caban Coch, Garreg Ddu, Pen-y-Garreg and Craig Goch create a total of 850 acres of wilderness water. Each of these reservoirs support an abundance of wild brown trout and are also stocked. Fly fishing only is permitted on the Elan Valley Reservoirs. 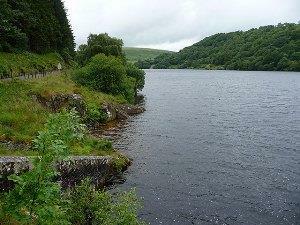 The Claerwen Reservoir is a 900 acre wild brown trout fishery which is also Fly Fishing only. All of the reservoirs are easily accessible with ample car parking. Due to the fantastic scenery and variety of wildlife including Red Kites, Buzzards, Peregrine Falcons, Kestrels, Sparrow Hawks and numerous other species, the Elan Valley is as much an attraction for its beauty as it is for its fishing. An extensive visitors centre is situated at the entrance to the Elan Valley with excellent facilities including a café / restaurant, museum, displays, film shows, shop, tourist information centre and toilets. Situated in the heart of the Cambrian Mountains, 3 miles west of Rhayader, lies a series of four wonderful Reservoirs and Dams. Caban Coch, Garreg Ddu, Pen-y-Garreg and Craig Goch create a total of 850 acres of wilderness water. Each of these reservoirs support an abundance of wild brown trout and are also stocked. Fly fishing only is permitted on the Elan Valley Reservoirs. The Claerwen Reservoir is a 900 acre wild brown trout fishery which is also Fly Fishing only. The Elan Valley Reservoirs are Troutmaster Waters and have hosted the Welsh National Bank Fly fishing Championships on many occasions.